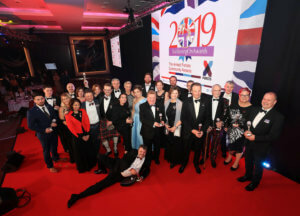 The 2019 Soldiering On Awards, celebrating the achievements of the military community, took place on the 5th of April in London at the Park Plaza, Westminster Bridge Hotel. The black-tie gala event was opened by the Awards’ Patron, the Rt Hon Earl Howe PC, Minister of State for Defence and Deputy Leader of the House of Lords, and presented by TV personality Carol Vorderman MBE, Honorary Group Captain for the RAF Air Cadets, with former Royal Marine, John-James “JJ” Chalmers. Soldiering On Awards’ Ambassador for the Arts, Carly Paoli, closed the evening with a performance in recognition of ‘Remembered: There But Not There’, honouring those who made the ultimate sacrifice during World War One. Inspirational throughout, the evening focused on recognising the outstanding accomplishments of those who have served their country, as well as the individuals and groups who work tirelessly to support the Armed Forces Community as a whole. Spectra Group (UK) Ltd was privileged to once again support the event by sponsoring the Sporting Excellence Award, recognising someone who has overcome their disability or injury to excel in the field of sport. The remarkable individual who won this Award, presented by Rear Admiral Michael Bath, Naval Secretary, Assistant Chief of Naval Staff (Personnel) and the Flag Officer Maritime Reserves, was Craig Monaghan. Craig lost ten men from his company during a tour in Afghanistan, which also left him with a traumatic brain injury and two perforated ear drums. Following three attempted suicides, Craig hit rock bottom. Amazingly sport helped him to recover and then go on to support others facing similar challenges. Craig first represented the UK in the Warrior Games, then received international honours as a member of the English Deaf Rugby Team. He has since helped more than 120 veterans back in to sport with a programme that he runs at Sale Sharks.